Ancient Stones - Lothian - 027 Standing Stone, Gogar, Edinburgh. 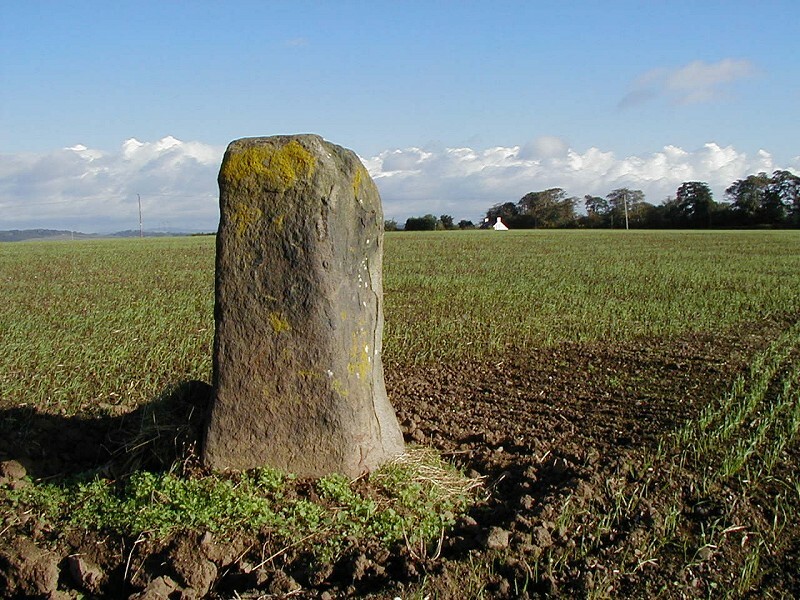 The Gogar Stane or Gogar Stone stands on the crest of a slight ridge in the middle of a large cultivated field and is a large four-sided block of whinstone reaching a height of 1.35m and has a girth of 2.60m at base. From A8 Edinburgh - Glasgow road, turn in at Gogar Stone and then turn first right. Lay-by is before the trees. A gap in the hedge will take you into the field. If under cultivation please walk along the perimeter of the field and approach the stone by following any tractor tracks. Small lay-by to south of stone. There is some reference locally to the stone marking the site of a Viking burial but the stone is probably much older. However, it may have had past associations with other ritual sites in the vicinity. Gogar Stone, a nearby farm was once the site for a medieval village, though no trace now remains. The name Gogar, may be derived from "cog" or "gowk" an Old Scots term for cuckoo, a bird with known ritual significance. 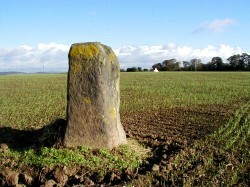 This is a good solid standing stone, situated on a prominent ridge of high ground with excellent open views all round. With the surrounding area under cultivation, probably for centuries, little can be seen that would give any indication to the stones original purpose. However, to the north, around Ratho, stands the Cat Stane and at Newbridge other stones can be found. A further stone remains at Cammo. Possible connections, we can only speculate?